West Virginia receiver T.J. Simmons (1) sees much in common with how Nick Saban and Neal Brown organize practices. 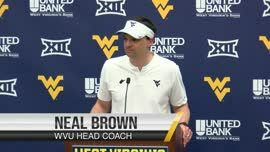 MORGANTOWN, W.Va. – Personality-wise, receiver T.J. Simmons concedes that Nick Saban and Neal Brown aren’t all that much alike. 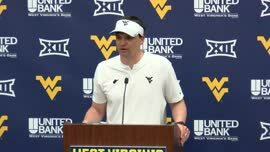 But in terms of how practice is structured, Simmons says there’s quite a bit in common between West Virginia’s new head coach and college football’s most successful one. 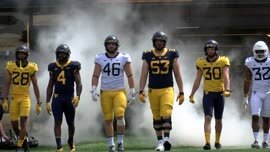 This is different than what Simmons experienced in his two years with Dana Holgorsen. Simmons thinks Brown’s method, like Saban’s, is going to make it tougher for players to relax. For Simmons, the style is a good match. That attitude helps when dealing with change as often as Simmons has. He will be playing for the fourth different offensive coordinator of his career. In his lone season at Alabama, Steve Sarkisian took over the Crimson Tide offense in the College Football Playoff after Lane Kiffin was hired at Florida Atlantic. 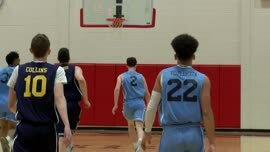 Now he’s picking up on new things from Brown even though much of what the Mountaineers do on offense will bear similarities to what they did with Jake Spavital. One of the primary differences is how involved Brown has been in helping coach the receivers. Simmons will try to make that emphasis pay off this season. 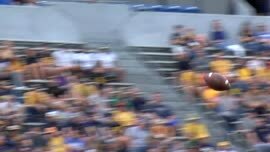 With David Sills and Gary Jennings headed to the NFL, he’s one of the receivers being counted on to fill their void. “I think T.J. is ready to take the next step and be a go-to guy,” Brown said at the outset of spring practice. Alex joined WVMetroNews in September 2018 after two seasons covering LSU sports for SEC Country. A scholarship recipient at Indiana University, he previously served as the McNeese State beat writer for The American Press in Lake Charles, La., provided freelance coverage for the Chicago Sun-Times, and worked as sports editor for The Journal-Standard in Freeport, Ill.